Ponderosa pine bark matures from very dark brown to a light reddish brown, becomes very thick, and, with all its plates and scales, looks like jigsaw puzzle pieces. The bark has a distinctive vanilla smell. The five to eleven inch long needles grow in bunches of three. The back of each scale on the cone is armed with a sharp spike. Ponderosa pine seeds are prized by birds, squirrels and chipmunks. The caches of seeds that they create help the tree spread its seeds by means other than wind. Ponderosa pine grows in the Sage Hills because it is well adapted to drought. Its deep taproot seeks out water during the summer, and it is able to close its leaf pores to prevent water loss better than other conifers. The waxy coating on its needles minimizes water evaporation. Ponderosa pine also does well in environments shaped by frequent fires. The tree facilitates frequent burning by providing plenty of ground fuel in the form of dropped cones and needles that contain a flammable chemical. The thick bark protects the living inner cambium tissue from damage by wildfire heat. 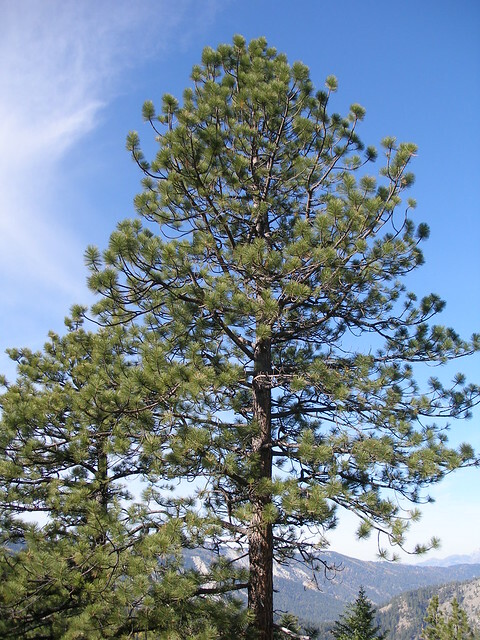 Ponderosa pine seedlings are able to withstand exceedingly high temperatures (162 degrees F) at the ground surface, so fires do not kill them as easily as competing vegetation. Mature trees have a branch-free trunk extending high above the ground because often the lower branches are pruned by repeated fires. Ponderosa pine ranks second to Douglas-fir in lumber production in the Northwest. Most knotty- pine paneling comes from young ponderosas. Native Americans found many uses for ponderosa pine. The tree’s sugar-rich inner bark, or sap layer, was harvested in late spring by removing the outer bark with axes and sharpened poles. The inner bark layer (much like thin plastic wrap) could be eaten directly. Stems and limbs were used as building material and for firewood. The sap was applied as a salve or ointment. They boiled the needles to make a brew taken for cough and fever. The pitch was used as a glue and a waterproofing agent. Dried pitch was chewed as gum. Needles and fine roots were woven to make baskets. Twigs served as twirling sticks to start fires, and the trunks were hollowed out for dugout canoes.